The 5th ALP International Symposium on AMBITIOUS LEADER’S PROGRAM Fostering Future Leaders to Open New Frontiers in Materials Science, Jozankei View Hotel, Sapporo, Hokkaido, Japan. Recently, I was invited to attend the 5th ALP International Symposium on AMBITIOUS LEADER’S PROGRAM Fostering Future Leaders to Open New Frontiers in Materials Science by my advisor professor. I was very happy and honored to receive the best Poster award in a symposium that have several respected and renowned researches. It was an inspiring moment in my scientific life. 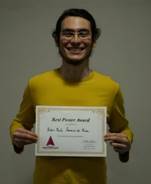 In this award, I would like to thank my advisor, Professor Hasegawa, and all the Professors in our laboratory that are always contributing my work with helpful and thrilling discussions. In this study, I investigated the addition of ethynyl groups in phosphine oxide ligand in seven-coordinate Tb(III) complexes. By changing the structure of the Tb(III) complex, induced by the ethynyl group, I expected to control the excited energy level of the tmh photosensitizer ligand in order to control (or promote) back energy transfer (BEnT). BEnT was accomplished in those complexes when ethynyl group was added. Unexpectedly, the total quantum yield of the Tb(tmh)3(PEB) complex was 71%. Finally, this complex is expected to be applied in future photonic thermo-sensor devices because of its high luminescence and sensitivity to temperature.